Most of us aren’t economists, but we do understand the basic principles of supply and demand, and the importance of resources, right? The basis of the traditional economic model is really quite simple: A society’s wealth depends on its supply of physical resources (land, labor, minerals, and water). The only way to get more of these resources is to buy them or take them from somebody else. And because of the scarcity of most resources, one person’s gain has to be someone else’s loss. This view of the world has spawned wars, revolutions, political movements, government policies, business strategies, and maybe a religion or two. History shows that people will always search for a better way to get a larger piece of the economic pie. But what if we viewed the world as providing unlimited resources that permitted the possibility of wealth for all? What if, like the ancient alchemists who tried to turn base metals into gold, we could create great value where little existed before? We don’t need to pretend–this is the way the modern world now works. Thanks to the magic of technology, we can expand the supply of resources available to us as well as create new materials to replace those resources the earth and cartels make hard to get. Technology makes it possible to turn the raw materials of nature into elegant and sophisticated devices more efficiently than ever. Because we can “make computers from dirt,” as mathematician Mitchell Felgenbaum recently said, we’re playing and entirely new game. The world has changed enormously in the last few years, and nowhere quite so dramatically as in economics and business. 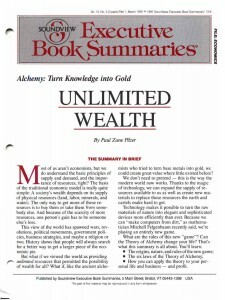 “Alchemy,” a dynamic new view at odds with classical economics, best describes our advanced economy now. Here’s the difference: While a traditional economist looks for better ways to slice up the same old pie, an Alchemist concentrates on baking a new pie that’s big enough for all to share. In other words, an Alchemist creates wealth; an economist merely moves it around. In this summary, you’ll see that the Alchemic world isn’t just a promising model, a hypothetical theory, or an abstract dream. It is, in fact, the world in which we live. Since World War II, the Western world’s wealth has continued to expand at an unprecedented rate. Because economic theory holds that a nation’s wealth is based on its use and distribution of scarce resources, economists are baffled. The sustained expansion enjoyed by the U.S. economy throughout the 1980s, for example, can’t be explained by any traditional economic theory predicated on the concept of a scarce supply of resources. So what’s happening? While it seems unbelievable, ours is a world of unlimited resources, one of unlimited wealth. In the Alchemic world, as in the economic world, a society’s wealth is still a function of its physical resources. Now, however, both the definition and the supply of those resources are almost exclusively controlled by technology. This new economy can cause confusion. For instance, in 1981 the U.S. Congress passed the Economic Recovery Tax Act (ERTA), which lowered individual income tax rates and provided tax incentives to businesses purchasing new equipment. Economists warned that the policy would lead to an economic collapse. But that didn’t happen: The gross national product continued to grow unabated. Clearly something was going on that no one could explain. It was, in fact, Alchemy at work. The ERTA forced corporate America to close the technology gap. In Alchemic terms, that’s the gap between the level of available technology and the level of that technology actually in use. With tax incentives directly connected to acquiring new equipment, America’s corporations retooled. And with increased productivity and lower production costs, the inflation rate decreased, the supply of capital increased, and interest rates remained stable. Historically, levels of technology have been measured in terms of ages (Iron, Bronze) and revolutions (agricultural, industrial) which usually lasted millennia, centuries, or decades. Technology, the driving force of a nation’s economy, now changes by the moment. 1. Technology is the major determinant of wealth because it determines the nature and supply of physical resources. 2. The advance of technology is determined mainly by our ability to process information. 3. The backlog of unimplemented technological advances (the technology gap) is the true predictor of economic growth for both the individual and society. Technology affects both sides of the traditional economic equation but it has a greater impact on the demand side. John Maynard Keynes predicted in the 1930s that people would lose their incentive to buy more after fulfilling basic needs, causing demand to fall. The opposite is true–the more people earn, the more they spend. Indeed, John Kenneth Galbraith said, in 1958, “In the affluent society, no sharp distinction can be made between luxuries and necessities.” Technology provides an ever-increasing array of new products that may start out as luxuries but soon become necessities–like the fax machine. In 1972 the shocking conclusion of the enormously influential study The Limits to Growth was that the world’s physical resources would be exhausted sometime in the next decade and most of humanity could be wiped out before the year 2100. The world’s population was growing at a rate of about 2 percent per year and industrial output was rising by 7 percent annually–both too fast to save our resource base. Economic growth, which had always been regarded as the solution to all woes, suddenly seemed to be the problem. Even the skeptics’ doubts about the report were soon washed away: Arab oil producers raised prices and cut off deliveries to the West. The future looked grim. Between 1973 and 1981, soaring energy prices sent the United States into some of the worst recessions in four decades. Yet the world didn’t come to an end. That’s because the study reached the wrong conclusion. The world’s physical resources aren’t decreasing. On the contrary, our effective supply of resources–oil, natural gas, copper, silver, gold–is increasing. What’s more, prices have tumbled as supplies have increased. We’re richer than we’ve ever been before. This is difficult to believe. You probably feel you have to work harder than ever simply to make ends meet. But the fact is you work significantly less than you used to in order to get what you want. Fact: In 1970 Americans worked three times as many hours to earn enough to buy a TV as they did in the late 1980’s. How is it that we have more resources at lower prices than ever before? Alchemy. The Theory of Alchemy recognizes that physical resources are neither scarce nor finite. What matters is not the particular resources but our growing ability to make more and better use of whatever is available. Wealth is the product of physical resources and technology, and of these two technology is the more important. W stands for Wealth, P for Physical resources, T for Technology, and n for the exponential effect of technological advances on themselves. The formula has enormous implications, the most important of which is this: We no longer have to try to slice the same small pie. Instead, we can find a way to bake a new and bigger one. THE FIRST LAW OF ALCHEMY – By enabling us to make productive use of particular raw materials, technology determines what constitutes a physical resource. Without technology, physical resources have no value. The discovery of the uses of fire made wood worth collecting. The development of milling and baking made grains worth cultivating. And the development of smelting made ores worth mining. Technology, too, has made important resources of commodities as mundane and ubiquitous as sand (the raw material from which silicon chips are made) and sea water (from which such minerals as magnesium–and even gold–can be extracted). At the same time, technology has actually diminished or erased the value of some former key resources like natural rubber, tin, copper, and sheet steel–all of which have been supplanted to a degree by substitutes made possible by advancing technology. There’s always an existing base of currently useful physical resources. A hundred years ago, however, this list would have looked very different from our resource base in the 1980’s. You’d have seen ivory and whale oil on the list, but not silicon, bauxite, and uranium. So the resource base has never been fixed. Moreover, the supply of current resources is always expanding. The amount of a resource is how much of it physically exists in the universe. But the supply, how much is known to exist and is available for our use, is determined as much by how we use resources as by the quantity available. The actual amount of oil buried in the earth is irrelevant. All that matters is the supply. THE SECOND LAW OF ALCHEMY – Technology determines our supply of existing physical resources by determining both the efficiency with which we use resources and our ability to find, obtain, distribute, and store them. To increase the supply of a physical resource we can (1) improve our ability to find, obtain, distribute, and store it (supply technology); and we can (2) improve the efficiency with which we use it (use technology). Supply technology has the more direct impact on our resource base. Consider the supply of oil. Over the past two or three decades, advances in geology led to the discovery of the huge Alaskan oil field. Improved drilling techniques allowed producers to delve into the earth’s crust to a depth of six miles instead of a mere five to ten thousand feet. Development of the super-tanker and advanced pipeline construction provided for more rapid distribution. Last, storage tanks made it possible to store heating oil in our homes and put gas stations on many street corners. But use technology can also expand the resource base by improving efficiency with which we employ a particular resource. For example, in response to the so-called fuel shortages of the early 1970’s, auto manufacturers replaced $300 carburetors with $25 computerized fuel injectors. By doing so, they doubled the fuel efficiency of new cars in less than a decade and increased the effective supply of gasoline by well over a third. As a result of the advances in technology use that were achieved in the 1980’s, the world’s effective supply of energy resources will be a full 50 percent larger in 2000 than it was in 1980. Former U.S. Treasury Secretary W. Michael Blumenthal regards information as “the key to modern economic activity–a basic resource as important today as capital, land, and labor have been in the past.” But developing new information is only half the battle; information is useful only to the extent that it can be efficiently distributed. Following the invention and development of writing five thousand years ago and the printing press only six hundred years ago, the third major advance in information processing is the computer. While its speed is an important factor, the computer’s true value lies in its ability to sort through and collate data, to link different sectors of society through communications networks, and to transmit the information through these networks. Even with this technological advancement, the main constraint on innovation today is the ability of engineers and entrepreneurs to make use of all the new developments. To increase the size of the pie, we must continue to improve our ability to process information so that technology will advance at a faster rate. The result will be an increase in the effective supply of existing physical resources and the definition of entirely new ones–increased, unlimited wealth for everyone. As a result of modern technology, we effectively have access to an unlimited supply of resources. What, in practical terms, does that really mean? For one thing, the key to achieving wealth is no longer the accumulation of resources. Many who attempted to exploit the fear of resource scarcity have already learned that lesson. In the 1970’s, various cartels tried to corner markets by dictating the price and supply of such basic goods as bananas, copper, rubber, and timber. By the mid-1980’s, all of the cartels had been driven out of business. They had mistakenly believed that nations couldn’t survive without these commodities, and that they’d pay any price rather than do without the goods. As prices rose, consumers began looking for substitutes. For example, as the price of copper rose, the telecommunications industry accelerated the development of new technologies such as fiber-optics that didn’t depend on copper wiring and cable. By the end of the 1980’s, U.S. telephone companies had installed 1.5 million miles of fiber-optics cable. In the Alchemic world, the market has no corners. As a result of technology, one can find a substitute for virtually any raw material. If accumulation of physical resources through attempts to corner the market doesn’t lead to wealth, what does? Efficiency in distribution. Technology has driven production costs of a product down to an average of just 20 percent of its retail price. The other 80 percent lies in distribution costs and profits. With few exceptions, we haven’t applied to our distribution networks the technological advances that have so profoundly transformed the rest of the supply pipeline. On the supply side of the Alchemic equation, improvements in distribution have the potential to yield tremendous financial gain. One exception is Sam Walton. Because distributors weren’t eager to service his first Wal-Mart in tiny Rogers, Arkansas, he started his own distribution system. Implementing the latest advances in data processing and communications technology, he constructed the most sophisticated automated distribution system the world had ever seen. As a result, Wal-Mart has grown, from its humble beginnings in 1962, to a $30 billion-a-year enterprise. It is likely to pass Sears and K mart on its way to becoming the largest chain in the world. Economists and Alchemists alike would agree with the Elizabethan philosopher Francis Bacon who observed, “Money is like muck, not good except it be spread.” The point of money is to be spent. Supply is useless unless it can be matched with some corresponding demand. If consumption doesn’t keep pace with rising income, prices fall, jobs are lost, economic growth grinds to a halt. Fortunately, demand does keep pace with income: Real per capita income in the U.S. rose 174 percent between 1940 and 1987, while real per capita consumption spending rose 172 percent. As advancing technology provides us with new products or processes which induce changes in our basic behavior, it both defines and determines the nature of human demand. Before the inventions of the the electrically powered agitator-type washing machine in 1922, for example, people simply didn’t wash their clothes all that often. Most clothing was constructed to require a minimum of laundering. Shirts came with detachable collars and cuffs. But once it became possible to wear a clean shirt every day, without tremendous effort, freshly laundered clothing became a staple of middle-class decency. Technology created a need that previously hadn’t existed, and by the mid-1930s, detachable collars and cuffs were a thing of the past. THE FOURTH LAW OF ALCHEMY: – By providing us with new products and processes that change the way in which we live, technology determines what constitutes a need, and hence the nature of consumer demand. The new needs technology creates–how many of you can’t live without a car phone?–generate demand in a self-fulfilling cycle that will continue as long as technology continues to advance. When consumers’ quantity demands those for more of what they already have (food, clothing, etc. )–are satiated, quality demands kick in. Quality demand is the desire for a new and different model of a product. From 1960 to 1980, the number of homes containing a television set rose from 90 to 98 percent. Then quantity demand kicked in: The number of homes containing two or more televisions rose from 11 to 60 percent. With quantity demand satisfied, consumers yearned for better TVs–those with giant screens, remote control, and stereo sound. Consumers, it seems, replace some of their quantity purchases with the improved products made possible by advancing technology. As long as technology continues to advance, better products will be developed every year, and the process will start all over again. By purchasing the new products technology makes available, you are, in effect, boarding an Alchemic train of virtually unlimited demand. In the Alchemic world of unlimited technology, there is no limit to your “real needs.” While economists may argue that what is available is a function of what you want, the Alchemist recognizes that what you want is a function of what is available. New products plant new ideas in your mind, but they also provide you with choice–one of the most potent stimulants of demand. THE FIFTH LAW OF ALCHEMY: – Technology determines the level of consumer demand by determining the price at which goods can be sold. The economist will argue that, since people really don’t like change, they’ll only buy new products or try new ways of doing things if the cost/benefit ratio is irresistibly favorable. The Alchemist recognizes that new products create their own need and the only constraint on demand today is price. If the price is right, you’ll suddenly find you have a need for that newfangled gadget you’ve heard about; at some price, you may even want more than one. Sure, anything will sell if it’s priced cheaply enough. But will the seller make a profit in the process? The economist will answer, “not necessarily.” The Alchemist, knowing that technology is the driving force of an economy, will answer yes. That’s because of the power of technology to lower the expense of materials and labor that go into production of a product. Production costs are a relatively small component of the total cost of making finished products today. Fixed expenses are far greater; they remain the same whether you produce one item or a thousand. So, the more items you produce, the lower the cost of each unit, and the lower price you can charge. And the lower the price, the more demand there will be for your product and the greater the likelihood that you’ll be able to sell the huge quantity of items you produced. All of this is standard practice among smart manufacturers. The Japanese used it to take the VCR market away from the U.S. companies that invented the device. Though called “dumping” by some it’s not unfair because the market still has to come through for you. The Alchemic entrepreneur knows that today’s consumers most likely won’t want tomorrow what they want today. Consumer needs and wants have always been flexible, but in recent years the rate of change in the marketplace has begun to accelerate. Products evolve, mutate, and change at speeds undreamed of in the past, partly because consumers learn about new products at the speed their television sets provide the information. It’s easy for them to decide they want something now. Those who make a good product and have a steady market are, paradoxically, at risk in this new world–either someone will come up with a better product at a lower cost or a new product may obliterate demand for what’s available. Blazing new trails has always been harder than improving old roads. But in the Alchemic future, the people most likely to prosper in business will be those who devote themselves to developing new products. Take the record business, for example. Despite great improvements in the price and quality of vinyl records and stereo turntables, the industry is well on its way to extinction. The reason is the coming of compact-disc technology. By 1989, just five years after their debut, CDs were outselling vinyl records by a hefty margin and the demand for CD-players had almost completely replaced the demand for conventional turntables. Alchemists recognize that, regardless of the product being sold, they are in the business of change. The nature of demand is infinitely plastic, the level of demand is unlimited, and there is no end to what people can, will, and must have. When President Kennedy announced in 1961 that the U.S. would land a man on the moon by the end of the decade, the technology to perform this feat didn’t exist. But as long as the consumer (in this case, the government) was willing to pay the price, it was assumed that technology could deliver. It did. This is the essence of Alchemic management. The new Alchemists have such faith in technology that they design products without worrying about the current level of technology. Their only concern is their reading of the marketplace. To survive in the fast-changing Alchemic world, you must anticipate what is coming and base your plans on what you think will be–not on what already is. THE SIXTH LAW OF ALCHEMY: – The immediate economic potential for an individual, an industry, or a society can be explained by examining the technology gap, the best practices possible with current knowledge and the practices in actual use. Traditional economics views technological advance as a byproduct of economic growth. The Alchemist sees this from the opposite perspective: Economic growth is a byproduct of technological advance. Technology is progressing so rapidly that we are simply unable to make use of everything it offers us. How many manufacturers use the latest CAD/CAM methods to design and fabricate products? How many retailers track inventory and customer preferences with point-of-sale scanners? Few of us question our routines with the regularity or the rigor that our fast-changing culture requires. This is, of course, the essence of the technology gap. Alchemists recognize that a wide gap signifies room for growth. They assume as a matter of course that the route currently used–even if it’s presently the cutting edge–will sooner or later no longer be the best one. They are always on the lookout for the better way that will appear. The better way that Alchemists search for is an R-I-T, that is, a Ready-to-be-Implemented Technological advance. An R-I-T already exists; it’s available now. But out of ignorance or laziness, we aren’t making use of it. Some current R-I-Ts are computerized fuel injectors that haven’t replaced mechanical carburetors, radial tires that haven’t replaced bias-ply models, or electric typewriters that haven’t replaced manual ones. An R-I-T is user transparent. It’s virtually the same as the product it was meant to replace. The only thing that has changed is that a job that was more difficult is now easier. A person who can use a rotary phone, for example, will find the push-button model easy to use. No new skills are needed, but the user can dial faster and more accurately. The implementation of R-I-Ts usually drives most start-ups. If you’re going to start a business today, it’s not enough to determine that you’re going to be as good as your competition. Consumers no longer have any patience with the status quo–so you’ve got to be able to promise to provide your product or service better, cheaper, or faster–and preferably all three. The new Alchemists stay on top of change by studying their industries to see if there exists a technology gap they can exploit. Even if they find one, of course, technology doesn’t stand still. So how do the Alchemists get a fix on what will be happening the day after tomorrow? The answer lies in our Basic Research Technological advances, or B-R-Ts. Studying and understanding the nature of R-I-Ts can help us determine what’s around the corner. By analyzing our B-R-Ts, we can preview what to expect over the next hill. Real advances in technology are links in a continuing chain of innovations. This is the multiplier effect of technology–every new development that we can identify as a R-I-T becomes the basis for an array of new technologies. In other words, it becomes a B-R-T. Over time, the B-R-T yields another R-I-T, and the process accelerates and widens with each cycle until it seems to be continuous. To see how this cycle works, let’s look at the development of a particular technological advance. A development laboratory discovered that silicon is a better semiconductor than germanium. This discovery became the basis of a B-R-T. Eventually, after several years of refining the development, the lab figured out a way to design and manufacture a new silicon semiconductor. The finished products represent a new R-I-T.
Five new companies, after learning of this R-I-T, use it as a B-R-T to develop a new finished product of their own, silicon transistors. The development lab’s R-I-T became the transistor maker’s B-R-T which used it to create a second R-I-T. Assume each of the five companies has twenty customers who use transistors in circuit boards, TV oscillators, thermostats, and other components. The one hundred component makers can use the silicon transistors as a B-R-T to develop new and better circuit boards, TV oscillators, thermostats, and other components, representing yet another new R-I-T. By keeping an eye on the latest B-R-T, the Alchemist stays ahead of the game–which may be the minimum necessary to survive. Author Paul Zane Pilzer wonders whether the word “recession” best describes the changing economic conditions of 1991 (and beyond). “What we’re seeing,” he told Soundview in an interview, “is rapid technological change causing displacement.” New technology lets us do things cheaper, faster, and better–but GNP may fall and people may lose their jobs in the process. Our definitions of GNP andrecession (two successive quarters of negative growth in GNP) may thus be outdated. “One of the largest factors in our GNP is the value of all the homes in America times the rental factor. Now what just happened to all the homes in America? Their prices declined 20 percent. That caused a massive decline in GNP. Paul Zane Pilzer has sympathy for workers displaced in today’s economy. But rather than protecting unproductive jobs, he believes society must begin to educate displaced workers. Society has to get that worker back into a job as soon as possible. That’s the hard part, because in the new Alchemic world success has less to do with mastering a specific task than with increasing our competence in basic skills–reading, writing, calculation, speaking, listening, and reasoning. Why? Because jobs in this dizzying age become obsolete rapidly, leaving only the flexible prepared for constant change. WILL JAPAN BURY THE WEST? Alchemy teaches that demand drives the economy and helps its citizens prosper. Japan, however, has meager internal demand due in part to a desire to save money and to an archaic distribution system that greatly increases the costs of basic items. Despite its high per-capita GNP, Japan has a much lower standard of living compared with the U.S. Its real estate prices are outrageous, and the people spend about 30 percent of their income on food (versus about 15 percent for Americans). Moreover, the average Japanese spends $13,500 per year for goods and services an American can buy for $7,800. As Japanese firms move their production facilities to the West to get closer to the action and cut down on distribution costs–Sony TVs sold in North America are all made there now, for instance, as are 61 percent of the cars they sell in America–they export capital, jobs, and their best and brightest managers. Says Paul Pilzer: “In a demand-driven economy they’ve done very well–supplying us with what we’ve demanded.” Unless they start buying more at home to sustain their own economy–which Pilzer believes they’ll eventually do–the Japanese will gradually lose their strength and influence.